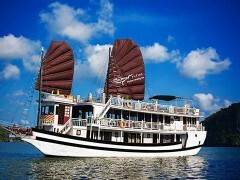 Swan Cruise Halong is a highly recommended cruise for exploring scenic Ha Long Bay in the Gulf of Tonkin. Our beautiful traditional designed vessels and facilities are the best and our main concerns onboard are your safety and the protection of the fragile environment of Ha Long Bay. We also support the local community through job offerings to supply our staff and supplies for our customers at the highest level possible. Let’s discover the world's natural heritage site with SWAN CRUISE – the world standard 3 stars cruise, we are committed to always offering the best available service to make your time with us memorable. © 2015 Swan Cruises Halong . All rights reserved.